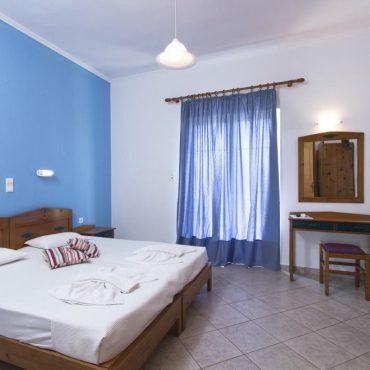 Mediterranean Apartments & Studios is a family hotel located 3 km from the port of Kissamos in West Crete. 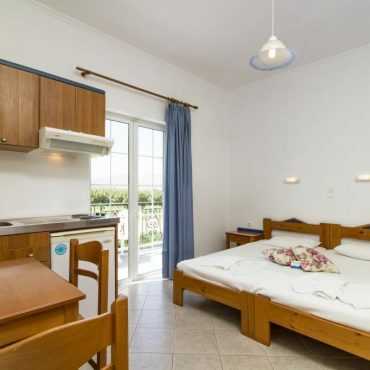 Kissamos has all of the facilities you require for your holiday. The Mediterranean is an excellent choice if you are planning to visit some of the most beautiful beaches in Greece. The West Crete beaches of Elafonisi, Balos and Falassarna are highly regarded and Elafonisi was voted number 9 best beach in the world by Tripadvisor last year. There is also a local sandy beach within 100meters from the Hotel. The Ancient town of Chania is 36km drive away. In our newly furbished good restaurant and bar you will experience Cretan hospitality and excellent local food prepared by our dedicated chef and served to you by our friendly team. The restaurant is located by the pool area and has fantastic views to the mountains and the twin peninsulars of Kissamos bay. All rooms and apartments are located on the ground or the first floor. They all have balconies with table and chairs and are equipped with free Wi-Fi, individually controlled A/C, flat screen TV, fridge and safe deposit box. We can provide you with a kettle, iron, hair dryer and baby beds upon request.